It was late 2011 when Clown Shoes first stepped foot in Texas, a turn of phrase I used in the title of a piece I did on their arrival back in my Examiner.com days. Looking back on what I wrote, while I made a point to share some thoughts on other products in the brewery's portfolio, there's no denying I was most taken with one in particular - that being the mythical beast of a beer known as Blaecorn Unidragon. In fact, not long after that the beer became a staple in my personal imperial stout rotation. Since then, the beer Clown Shoes says is brewed with a "monstrous amount of malt" has gone on to form the basis of a number of different offshoots. One of these, Porcine Unidragon, was a barrel-aged version of Blaecorn brewed with beechwood-smoked malt. Another, called The Good, The Bad and The Unidragon, was a Texas-only release using dark malts sourced from the state's Blacklands Malt Company. The latest entry in the series is A Fistful of Unidragon, and while the name may or may not imply it, the beer is one that's seemingly been influenced by each of the above incarnations. Also a Texas exclusive, it's a barrel-aged version of The Good, The Bad and The Unidragon that adds Blacklands' mesquite-smoked malt to the baseline recipe. Image the property of Tenemu.com/Brian Brown. Taking stock of the result, the swarthy brew that is A Fistful of Unidragon emits ample aromas of dark chocolate, backed by moderate bourbon, light smoke and some lingering wood tones. The chocolate intensity maintains throughout the taste and into the bitter finish, met there by a stronger sense of both smoke and bourbon. Regarding the first of those descriptors, A Fistful of Unidragon isn't exceedingly smoky, but the mesquite has a presence that contributes well to the beer's complexity. Considering the ingredient's origin, I suppose you might even say it has a taste of Texas terroir. On the topic of the bourbon, though, one could certainly say that A Fistful of Unidragon has a bit of a boozy air about it. It doesn't quite drink like a shot of bourbon, but there's a lasting warmth that leaves little doubt that this beer is a stiff drink. The good thing is that the malt base is rather burly to begin with, so in that respect things never seem too far out of balance. Despite the show of strength (and an ABV of 14%), A Fistful of Unidragon drinks remarkably well. A fair dose of carbonation helps to lighten the load of what is otherwise a full-bodied affair. It's not so much that the beer has a thick and heavy feel, but the palate is chewy and the flavors do tend to coat the tongue with what amounts to a dark chocolate, bourbon-laced blanket. Naturally, this works to create a lasting impression of the beer's flavor profile that stays with you long after each sip is spent. All things considered, at least for me A Fistful of Unidragon stands out among the growing ubiquity of bourbon barrel-aged stouts. The reason likely has to do with how the smoked malt adder has been executed, as it seems to give the beer that little something extra. Then again, "extra" is a term that could be used to describe everything about this beer. 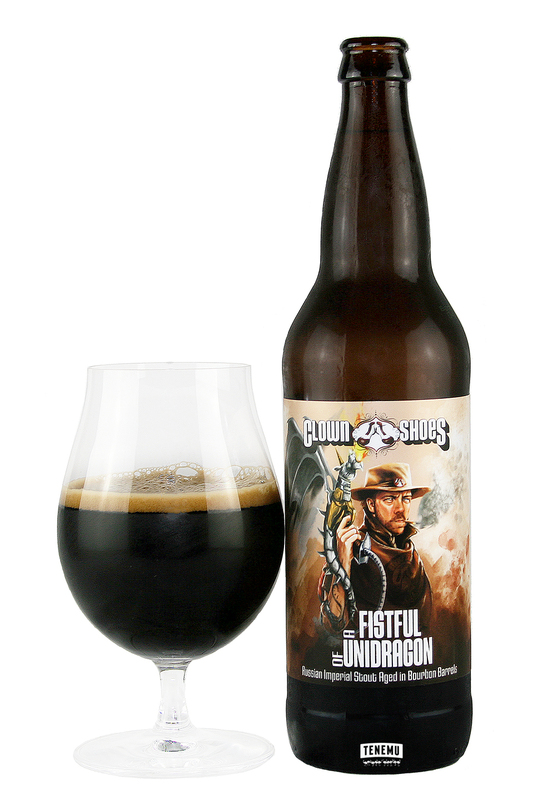 A Fistful of Unidragon is big and bold, to be sure, but that just makes it a beer befitting its Texas roots.